The Yorkshire Terrier (or ‘Yorkie’) was bred in Yorkshire, Northern England in the 1800’s to hunt and kill rats and other vermin. It was carefully bred from a number of working terriers, some of which came to England alongside Scottish immigrants looking for factory work. 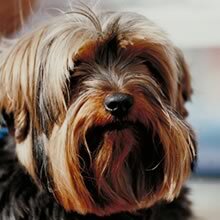 The Yorkshire Terrier may have derived its long coat and blue coloring from the Clydesdale and Skye Terriers, and its signature coat pattern likely results from crosses with the English Black and Tan Terrier. Early Yorkshire Terriers were known as Broken-Haired Scotch Terriers or Toy Terriers. Huddersfield Ben, born in Yorkshire in 1865, was a popular champion and skilled ratter who sired many small Yorkshire Terriers and is today universally recognized as the patriarch of the breed. The Yorkshire Terrier was imported to America in 1872 and recognized by the American Kennel Club in 1878. The Yorkshire Terrier became the American Kennel Club’s second most registered dog in 2006 at 48,000 registrations, beat out only by the Labrador Retriever. Famous Yorkshire Terriers include Audrey Hepburn’s Yorkie ‘Mr. Famous’ who appeared with her in ‘Funny Face’ and Tricia Nixon’s pet Yorkie ‘Pasha’. ‘Toto’ from ‘The Wizard of Oz’ was played by a Cairn Terrier in the film but originally illustrated as a Yorkshire Terrier in the novel. Some Yorkies are famous for their small size, such as Big Boss, Guinness World Record holder in 2002 for smallest living dog at 12 cm (5 in) tall, and Sylvia, a Yorkshire Terrier from England who was the smallest dog in recorded history at 2.5 inches tall and weighed merely 4 ounces! The Yorkshire Terrier is 20-23 cm (8-9 in) tall and weighs 2-3 kg (4-7 lbs). Yorkshire Terriers have a small, flat head, level or scissors bite, dark, intelligent eyes, and small, highly set, ‘V’-shaped ears. They have a flat back, round ears, and tail carried high. The Yorkshire Terrier has a very long, straight, silky coat which is golden-brown at the head, chest, and legs. The color and texture of the coat are perhaps the most important show trait. Puppy Yorkshire Terriers are born black and tan and gradually attain their natural color. Show dogs are groomed with the hair grown out long (sometimes trimmed to floor-length) and parted down the middle of the back. Yorkies have no undercoat and shed little. Yorkshire Terriers become attached to their families, but most maintain some measure of independence. They have a boisterous Terrier personality that far exceeds their small size. Yorkies are lively, bold, and intelligent (scoring in the top third in dog intelligence tests). They bark when they sense danger. Due to their strong ‘alpha-dog’ personality, the Yorkshire Terrier may not be suitable for inexperienced owners. Yorkshire Terriers become attached to their families, but most maintain some measure of independence. They have a boisterous Terrier personality that far exceeds their small size. Yorkies are lively, bold, and intelligent (scoring in the top third in dog intelligence tests). They bark when they sense danger. Due to their strong ‘alpha-dog’ personality, the Yorkshire Terrier may not be suitable for inexperienced owners. The Yorkshire Terrier is tolerant of older children, provided they respect its personal space. Due to its small size and bold temperament (which arises from its working origins) the Yorkshire Terrier is not recommended for young children unless carefully supervised. The Yorkshire Terrier can occasionally be a bit too brave when dealing with larger dogs, but gets along fine with cats and other household pets. Yorkies prefer life indoors, and are especially unsuited to cold climates. You can find Yorkie puppies priced from $200 USD to $6500 USD with one of our credible breeders. Browse through our breeder's listings and find your perfect puppy at the perfect price. The Yorkshire Terrier is tolerant of older children, provided they respect its personal space. Due to its small size and bold temperament (which arises from its working origins) the Yorkshire Terrier is not recommended for young children unless carefully supervised. The Yorkshire Terrier can occasionally be a bit too brave when dealing with larger dogs, but gets along fine with cats and other household pets. Yorkies prefer life indoors, and are especially unsuited to cold climates. The Yorkshire Terrier requires intensive brushing and combing on a daily basis. If this is too time-consuming, the coat should be trimmed professionally. The Yorkie’s hair should be kept out of its eyes by a rubber band or a bow. Loose hairs should be regularly removed from ear passages. Yorkshire Terriers have a lifespan of 12-15 years. Yorkie puppies are prone to hypoglycemia (diagnosed by listless behavior and shakiness) and adults are prone to a number of musculoskeletal issues and distichia (extra eyelashes on the eyelid which can scratch the cornea if not properly treated). Yorkies under 3 pounds are especially susceptible to diarrhea, vomiting, tracheal collapse, anesthesia sensitivity, and injury. The Yorkshire Terrier is intelligent and capable of learning quickly with consistent training, but some prolong the process with their independent, stubborn nature. The Yorkshire Terrier is considered to be one of the more difficult breeds to housebreak. The Yorkshire Terrier can have most of its needs met through indoor play, but still prefers a daily walk or romp in a fenced-in yard. Yorkshire Terriers are well suited to apartment life. Yorkie Puppies for Sale - Shipped Worldwide! Finding the right Yorkie puppy can be dog gone hard work. PuppyFind® provides a convenient and efficient means of selecting and purchasing the perfect Yorkie puppy (or Yorkie puppies) from the comfort of your home, 24 hours a day, 7 days a week. Take advantage of our PuppySearch or leisurely browse our directory of hundreds of dog breeds, Yorkie dog breeders, Yorkie dogs for adoption, and Yorkie puppy for sale listings with photos and detailed descriptions. Some Yorkie puppies for sale may be shipped Worldwide and include crate and veterinarian checkup. Many Yorkie dog breeders with puppies for sale also offer a health guarantee. With thousands of Yorkie puppies for sale and hundreds of Yorkie dog breeders, you're sure to find the perfect Yorkie puppy.